Charles Follen, a professor of German at Harvard, prepared this version as an aid for students learning German. 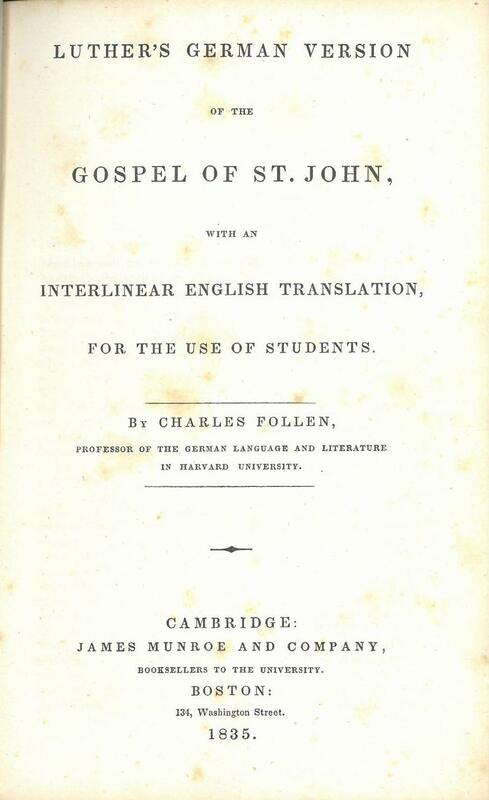 Title: Luther's German Version of the Gospel of St. John, with an Interlinear English Translation, for the use of Students. By Charles Follen, Professor of the German Language and Literature at Harvard University. Publisher: Cambridge: James Munroe and Company, Booksellers to the University. Contents: Gospel of John. The first part of the book contain the Gospel of John in German (Luther's version) with an English interlinear translation. In the second part of the book, the Gospel of John is given in German. Comments: A pdf facsimile is available at archive.org.